When my oldest was just a baby, potty training (or potty learning) was the one parenting task I dreaded the most. It seemed that everyone had horror stories to share about children withholding bowel movements until medical intervention was needed, cleaning up messes in public, stubborn refusal to use the “big potty,” and much more. I wanted to bury my head in the sand and forget that he would ever need to learn how to use the restroom. Creating a social story using a beloved toy can help facillitate potty learning. Thankfully, BigBrother was easy on me. He learned to use the bathroom quickly, easily, and at a young age (27 months). His sister, too, was easy to help in the bathroom. She was slightly older (2 ½ years) when she announced, “I use the potty now!” She spent a week wearing just her bathing suit (easy on, easy for her to take off), and we never looked back. Both were dry at night around age three. As I joked to my husband, the Little Dudes are payback for the older two being so easy! I recently wrote on my blog that PuddinPie is four and nowhere near potty trained. Children with Childhood Apraxia of Speech are often late to use the potty. He has little control over his mouth muscles and as he is getting older, we are seeing more issues with his fine motor skills. With this comes some anxiety, and PuddinPie’s anxiety seems to manifest itself in the bathroom. He refuses to even sit on the potty. We need to be patient. The ball is in PuddinPie’s court. He will learn to use the restroom, but on his own time. Getting angry and frustrated with him won’t speed up the process. The educational team asked us to make sure there is nothing physically wrong with him. At a routine appointment, his doctor confirmed that PuddinPie is otherwise healthy. He goes to the bathroom easily and doesn’t have an infection. He says he won’t worry about the lack of potty training until closer to kindergarten, at which time we will consider testing to see if there is a deeper medical issue. Model proper bathroom use. We’ve done this since day one because, honestly, what parent can use the bathroom alone? Put him in charge of his toileting and clothing changes. PuddinPie dresses himself as much as he can. When his diapers are wet, I have him take them off and dispose of them. When he’s dirty, we ask him to flush the toilet, modeling that solid waste goes into the toilet. We’ve also started allowing him to feel wet. He refuses to wear training underwear, and Easy-Ups are too absorbent. I’ve bought some bigger cloth diapers (Kawaii Baby and Hiney Liney are great for children over 35 pounds, and both can be found at our affiliate Kelly’s Closet) and only put one insert in them. This allows him to feel wet without soaking his clothes and upsetting him. We were also advised to weave using the restroom into social situations. When I ask my older children if they need to use the restroom before going somewhere, I now include PuddinPie in this. He recently asked to spend all day with a friend and we told him when he could, once he uses the potty. (He still plays there but generally only with me around, as I don’t expect my friend to change his diapers.) 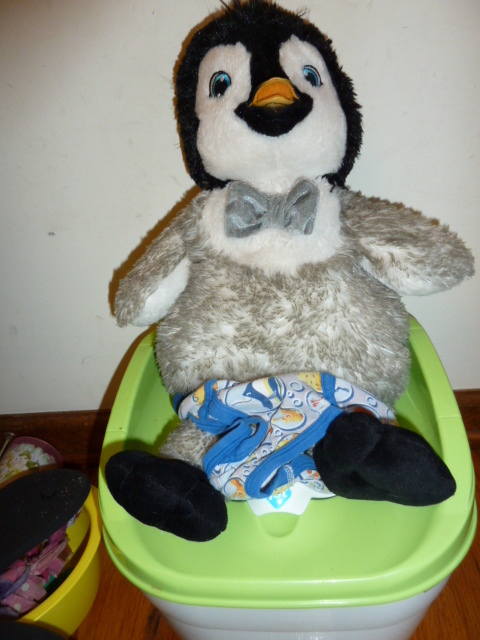 His teachers and I are putting together a book about his stuffed penguin who uses the restroom, and PuddinPie is now in a classroom with slightly older children … and boys who use the bathroom. We’re hoping the positive peer pressure will help him see that using the potty isn’t bad! As with everything since his birth, PuddinPie is still teaching me to be patient and that he will do things on his own time. This includes using the potty! On really hard days, I just remind myself that he won’t go off to college wearing diapers. It sounds trite, but it helps to keep the big picture in place. Do you have a late potty learner? What tricks helped your child master using the restroom? Great advice! My son is almost three and has zero interest in potty learning. I’m just waiting for him to take the lead. My other son is three and thinks fake-pooping is funny but refuses to use the potty. Sigh. Thanks for this post! I am very frustrated with my son’s potty (non) use at the moment & needed some tips! thank god I am not the only one out there. It is very refreshing to know this. My son is three in a half and uses the potty to only go pee. Pooping in it is a struggle. He states that he is scared of his poo. Lol. I have just been reassuring him that it is ok nothi g to be scared off. Although I do get a good chuckle out of it cause some of the things he says are so obscure and absurd. I also think because I have a six month old this is way of showing his jealousy or it is some sort of control thing on his part. He is very stubborn by nature. I get tons of flack from family stating “you better get on this or else he will be wearing pull ups forever” I just smile. I know when he is ready he will do do it. Patience is a virtue…sometimes our little ones teach us more than we realize 😉 what worked for my son was seeing another child, younger than him, using the potty…if they could do it, so could he! !